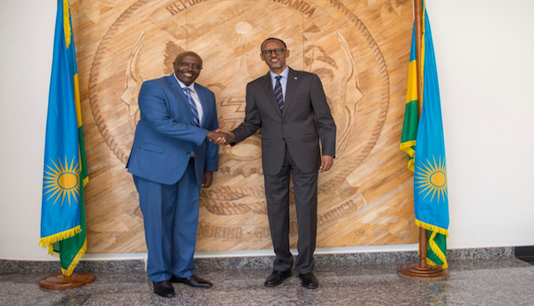 After a decade as Ambassador to Rwanda, Richard Kabonero, bid farewell to President Paul Kagame earlier today after a successful tour of duty as Uganda’s High Commissioner to Rwanda. He wrote a deeply touching letter. After 10 wonderful years of living and working among you, my tour of duty as Uganda’s High Commissioner to this beautiful country has come to an end. I must start by thanking my President, H.E Yoweri Museveni, for the opportunity to represent the people of Uganda in Rwanda. It has been a truly remarkable and enriching journey, as with the rest of the world, I have watched with awe as you transformed a tragic past into a future full of hope, and your country, into a land of opportunity and progress. I have witnessed the selfless commitment of your leaders to uplifting all citizens, while creating opportunities for all. I have seen your sons and daughters serve both at home and abroad, with unwavering commitment to serving the vulnerable and less fortunate. The results that you have achieved with dignity, haste and independence are the reason why today, Rwanda is one of the leading countries on our continent. I arrived in this beautiful country uncertain of what lay ahead, but I leave with the conviction that our two countries with their sense of shared history, are on a journey of prosperity and peace. The challenges that face our two countries may always exist. The most critical input should be that we tirelessly search for solutions to meet these challenges. To quote your illustrious Foreign Minister Louise Mushikiwabo, nothing is too difficult for Uganda and Rwanda to solve. I have woken up every day in your land, determined to advance our shared interests in enhancing cooperation between our countries, to emancipate Ugandan and Rwandan citizens alike and for our region to claim its place on our continent as the best place to invest. I have held discussions with your leaders to address critical bilateral challenges and together, we have celebrated our breakthroughs. I commend the integrity and commitment of your leaders at every level. Their resolve to do things their own way; the Rwandan way, and succeed, serves as a beacon of hope for our region. I wish to thank each and every one of you, for your assistance during my tour. I am extremely grateful that you embraced me as one of your own. I have broken bread in your homes, visited your offices, toured the breadth and depth of your land and have met citizens both humble and mighty. As I leave Rwanda, the countless number of new and binding friendships that I leave with, overwhelms me. This April, I joined you once again in remembering your loved ones and in celebrating your remarkable achievements in the last 23 years. I reserve special thanks for H.E the President of Rwanda for his guidance and help during my time here. His exemplary leadership will always be a source of inspiration for all who serve in this country. My appreciation and gratitude also goes to the First lady for her tireless efforts on behalf of Rwandan citizens, and her generosity to the Diplomatic Corps, which I was privileged to lead. There are many people on whose help and guidance I have come to count on over the past 10 years, but I cannot possibly name them all here today. But please allow me to give special thanks to my friend and sister of over 20 years, the Hon Louise Mushikiwabo, for her friendship and unwavering commitment to our bilateral, regional and continental progress. My deepest gratitude to my colleagues, the members of the Diplomatic Corps, for your support and the honor of serving as your leader. I extend my appreciation to my counterpart in Kampala, Ambassador Frank Mugambage, without whose cooperation we would not have come this far. I appreciate your candor and comradeship through all the discussions and strategy sessions we held, to resolve difficult issues. The progress we have made would not have been possible without the dedication and hard work of our team at the Uganda mission. I thank, and appreciate the service of, both the current and past staff members. I would be remiss not to thank the members of the Ugandan Community, and in particular, the Association of Ugandans in Rwanda, for all that you do daily to support our mission in executing its mandate. Finally, to you my Rwandan family, I shall always be one of you: from the policemen and immigration officers at the airport, to the farmers I met in villages all over the country; from the men in the shadows who prefer anonymity, to the pilots that soar in the amazing Rwandair planes; from service providers in grand hotels, to the remarkable officers at MINAFFET; from journalists, to the young and talented people in both private and public sectors; from service chiefs to Ministers; and entrepreneurs to Governors. I thank you all for your incredible generosity and wish you the best in everything. I shall cherish the memories of my stay in Rwanda and I look forward to coming back to visit, as an East African citizen. God bless you and this country. 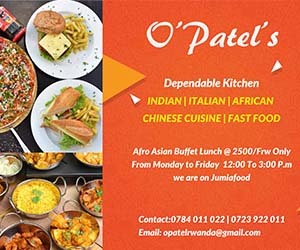 Mugire amahoro.